Doctor Strange stories continued from Strange Tales. 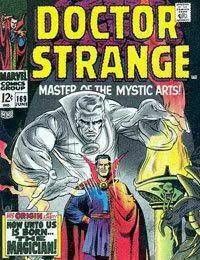 1st Doctor Strange in his own title. Cover art by Dan Adkins. The Coming of... Dr. Strange, script by Roy Thomas, art by Dan Adkins; Origin of Dr. Strange retold; Stephen Strange seeks out the Ancient One in Himalayas in hope of a cure for his damaged nerves; He discovers that Baron Mordo, a pupil of the Ancient One, is plotting to kill his teacher; Strange warns the Ancient One and then asks to study the mystic arts.